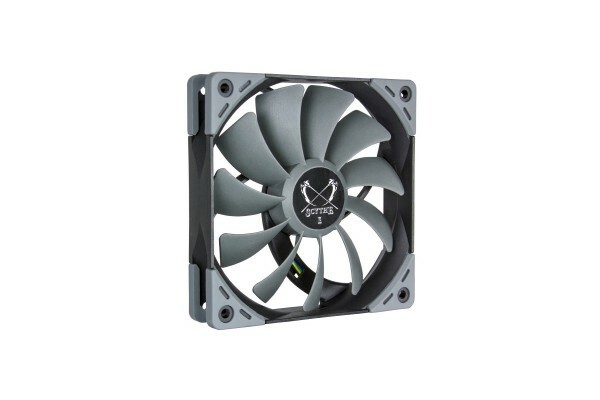 The PWM versions of the Kaze Flex fan series, previously known from their use in the Mugen 5 and widely praised by testers, are now available separately. Here, too, the sealed precision FDB ensures a lifespan of over 120,000 hours. The decouplers mounted to the fan frame reduce vibration and create very little background noise. The Kaze Flex PWM fan series is available in two volume levels, offering you the choice between a well-balanced RPM range or an absolute low-noise option. In order to guarantee quiet running and a long lifespan, the fans in the Kaze Flex series use a sealed fluid dynamic bearing (FDB). The bearing and shaft are made entirely of high-quality compressed metal and are coated with a special heat-resistant (up to 250°C) oil film. This drastically reduces friction to ensure quiet running and reduced wear and tear, resulting in an average lifespan of 120,000 hours. The Kaze Flex fan series comes equipped with anti-vibration and shock-absorbing rubber padding on the tunnelless mounting holes. These decouplers effectively prevent any potential vibration transfer and contribute to the fans' silent operation. The PWM models in the Kama Flex series can be regulated via pulse width modulation using a PWM-compatible motherboard. This lets you dynamically adjust the fan RPM to suit your operating conditions and prevent unnecessary noise generation. A generously-proportioned 50 cm sleeved connector cable and an adaptor for direct connection to a power supply enable installation in virtually any system.